The Evil Within's third DLC stars The Keeper, and, as such, I was really tempted to do a "play it safe" joke. Thing is, I'm not sure if The Executioner is playing it safe or not. On the one hand, it does away with the over-the-shoulder camera of the main game in favour of a first-person view. On the other, it's an arena add-on—a series of battlegrounds in which you thwack and slash at various enemies. There will, however, be some story in the mix. 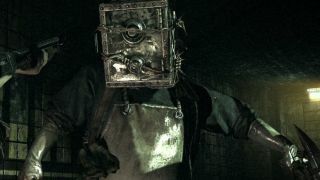 "Initially armed with The Keeper’s signature hammer," explains the trailer's description, "players will fight against a host of The Evil Within’s iconic villains to earn new weapons and upgrades. Set in the Manor House of the Victoriano Estate, The Executioner features first-person melee combat combined with exploration and discovery as players unearth the story of a man forced to become The Keeper." The Executioner is out on May 26.